All brokerage firms are unique and each firm seeks something different when evaluating the benefits of different Brands to join. Through our interviews we noticed there are subtle differences between the benefits, but the common benefits are a larger internal market reach for resources, marketing tools, subscriptions, and a recognizable Brand to demonstrate to clients the support system behind the independent brokerage firm itself. Quick overview on company: how many offices, agents, cities/markets, countries, what services are offered (Agency Leasing, Tenant Leasing, Property Management, Investment Sales, etc.)? CORFAC firms have 1,000 employees in 47 offices in the U.S., 4 in Canada and 27 internationally including a global presence in Australia, Colombia, France, Germany, Ireland, Israel, Italy, Mexico, Romania, Russia, South Africa, South Korea, Switzerland and the United Kingdom. Average tenure of a CORFAC firm is 15 years. That says a lot about the quality, value and longevity of the network. After 28 years, we continue to grow. Founded in 1989, CORFAC is a network of privately held, independently owned, entrepreneurial commercial real estate firms with expertise in office, industrial and retail, tenant and landlord representation, investment sales, multifamily, self-storage, acquisitions and dispositions, property management and corporate services. CORFAC firms completed more than 11,000 lease and sales transactions totaling 500 million square feet of space valued in excess of $8.5 billion in the last year. What Services/benefits does your firm offer? An international, independent, commercial real estate referral network with reach around the globe. Deal-Making sessions during and between conferences, discounts on industry leading education, products and services, two annual conferences focused on networking, sharing best practices, cutting edge education programs and networking events, member webinars, internal and external marketing support, member toolbox with resources shared by many member firms, family atmosphere, knowing you will be dealing with a principal member when you contact another CORFAC office, presence at several industry tradeshows (SIOR, CCIM, ICSC), a strong commitment to our next generation members, new member website, trust, etc. How does the marketing/advertising work? Is there National marketing and then each office does its own marketing/advertising? Is there one community marketing/advertising effort, or is there a hybrid? CORFAC International’s tag line says it all: Locally Owned. Globally Connected. The CORFAC organization is branded on a global level and promotes the brand in major industry media outlets on behalf of all offices. The organization also provides branding and marketing materials for each member office, which is independently owned and operated, for use in their local/regional market and with clients. CORFAC’s headquarters staff works with member-led committees to carry out the objectives of our multichannel integrated marketing plan, which includes member-to-member communications, social media, digital content, thought leadership and print and online advertising. In general terms what are the costs/ fees for an office or agent to join your company/organization? (Annual or monthly fee and/ or % of commissions)? Annual costs for CORFAC (through membership dues only) are half to three-quarters of most national networks. We have not raised dues in 9 years. Brokers keep 100% of commissions earned on closed transactions (no headquarter fee split). It is an independent network where companies keep a separate identity and their company name in addition to the CORFAC branding. While we always encourage our members to think CORFAC first, members are allowed to do deals with companies outside the network without penalty. Your agreement with CORFAC is year-to-year and not a long-term contract. Can you elaborate on how your organization promotes cooperation and co-working between the different offices within your organization? Members collaborate face-to-face at two conferences a year (Spring and Fall) for education, to share best practices, to network with CORFAC colleagues, to conduct deal-making sessions, to learn the latest technology trends and to gain insights from top industry service providers. Members also share the “think CORFAC first mentality” and a family-like culture in the network. Our members also collaborate via specialty calls and webinars, awards and recognition programs that recognize referral deals within our network and firm and member involvement on committees that drive the organization. What makes your Company or organization the best option for an independent commercial real estate firm to join with and what they can expect to gain through your organization? A global name and brand that has been around for almost 30 years. Annual costs for CORFAC (through membership dues only) are half to three-quarters of most national networks. We have not raised dues in 9 years. Brokers keep 100% of commissions earned on closed transactions (no headquarter fee split). It is an independent network where companies keep a separate identity and their company name. Our members openly share market information, best practices and client referrals with one another – it is a collaborative, not competitive, network. While we always encourage our members to think CORFAC first, they are allowed to do deals with companies outside the network with no penalty. Your agreement with CORFAC is year-to-year and not a long-term written commitment. All of the aforementioned benefits and services as well. When members join, they stick around (average firm tenure is 15 years). We are not just trying to put dots on a map. We have a certain culture and family environment. We want to make certain any new member will fit in well. TCN Worldwide was formed in 1989 and is a member-owned international real estate affiliation comprised of independent real estate service firms/offices in some 48 offices serving more than 200 markets worldwide, and encompassing some 700+ brokers and salespeople. In coordination with our partners at GVA Worldwide, we have expanded that coverage to over 170 offices in 25 countries with over 5,500 professionals. 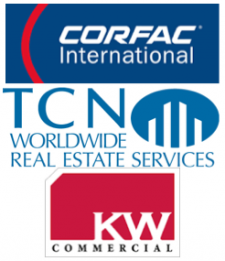 TCN Worldwide is one of the largest service providers in the industry and was recently ranked as the 8th largest commercial real estate organization by National Real Estate Investor. We offer comprehensive commercial real estate transaction, management and consulting services including, but not limited to: Property/Asset Management, Acquisition/Disposition, Investment Sales, and Tenant/Landlord Representation. TCN serves the owners and managers of our member firms by providing them education, best practices, cost containment strategies and a host of support services to help them manage and grow their businesses. We are a key part of their recruiting and retention efforts, and offer one of the very few forums for these business leaders to compare strategies and learn from their peers. From an economic standpoint, the ability to recruit or retain just one producer who may have opted for another firm with greater coverage or resources combined with the ability to learn from one’s peers to avoid mistakes or learn new strategies provides a positive return on investment for our membership. In 2016, we completed an organization-wide benchmarking evaluation covering desk costs, tools and resources, compensation and other factors in operating a brokerage company. This information is available to the Principals of our member firms and we integrate best practices sessions into all of our meetings and events. The brokers/agents of our member firms look to TCN to provide them with tools and resources to “make the First Sale”. The “First Sale” is getting hired. Whether it is our educational programs, Investment Property database and blast email program, Client Contact database or library of proposals and presentations the tools offered are designed to help the brokers/agents win more business in their own markets. How does the marketing/advertising work? Is there National marketing and then each office does its own marketing/advertising? Is there one community marketing/advertising effort, or is there a hybrid? It’s a hybrid, TCN Worldwide is comprised of leading independent commercial real estate brokerage firms and as independent firms each have in-house marketing initiatives that are separate and independent from TCN. However, TCN helps to support these efforts through collaboration as well as our national marketing/PR programs. For example, we host regular marketing teleconferences and webinars that allow the marketing staff across the organization to brainstorm, discuss what is and is not working, as well as what tools and resources they find most valuable. Based on committee feedback and member needs we help coordinate group national and regional advertising, national vendor discounts, and provide support for their overall marketing efforts through co-branded materials, presentations, and a best-in-class proposal library. Our dues structure is based on a formula tied to the population of the market area served. We select members after a thorough interview process that includes benchmarking their relative strength in the market, overall stability, expertise and reputation. A final crucial factor is that the prospective member firm evidences a willingness to be engaged and involved in our partnership – we are not looking for passive member firms. At its core, TCN is designed as a tool to serve two key clients – the owners and managers of our member firms and secondly their agents/brokers. To promote cooperation and co-working, TCN hosts regular conference calls for the marketing and support staff to share ‘best practices’, new programs and ideas, and new resources from the TCN staff. We also host monthly/quarterly conference calls for industry specialty groups to share leads and information, as well as regional Principal calls to encourage communication between our owners and the various offices. We provide training sessions, benchmarking tools and “best practices” sharing to assist each member firm in reaching its potential. In addition, there are two international TCN conventions per year plus regional meetings. Each year we conduct a training boot-camp—A reasonably priced training ‘TCN Institute’ for young to mid-level agents. This program is taught by industry professionals and the 2-day session is designed to accelerate the productivity of the attendees. Like other national and international affiliations, we offer the opportunity to receive assignments from outside your market and the ability to service your clients’ needs around the world. However, beyond that basic standard, we are a unique and focused organization. Unlike alternative organizations, TCN realizes that within our industry approximately 95% of your business has been and will be locally based; however, the competition for this business has been changing rapidly. TCN Worldwide is unique in the fact that our organization is focused on providing tools and resources that are designed to make our member firms more successful and valuable for their owners, employees, brokers and agents. TCN Worldwide is owned by the member firms and is exclusively focused on meeting their needs. KW Commercial promotes a family atmosphere and focuses on individual business and profitability. KW Commercial’s 1,800 agents are dynamically connected through technology and have access to approximately 150,000 real estate professionals in more than 750 offices. Approximately 87% of KW Commercial’s transactions are sales transactions and 13% are leasing transactions. What Services/benefits does your firm offer to its Offices and Agents? KW Commercial offers a number of marketing tools, training programs, and real estate software tools to its member offices. Included in its membership fee, all KW Commercial agents have an account at Buildout. Through Buildout, agents are able to create marketing materials for their listings and push said listings into a number of listings platforms (including LDCRE.com). Membership fees are $125 per agent, per month, which includes a number of memberships and tools. KW Commercial promotes a family atmosphere and focuses on individual business and profitability. *For additional information on each of the above Commercial Real Estate Firms please visit their websites, which are Hyperlinked to their logos and Company Name in the top line of each Firm’s overview.